Sculptor Andy Scott graduated from Glasgow School of Art in 1987. He is a figurative sculptor who works in steel and bronze, combining traditional figurative symbolism with contemporary fabrication techniques. This sculpture measures 19.5 metres & is made of stainless steel and cast bronze. It celebrates the spirit of thanksgiving and regeneration. 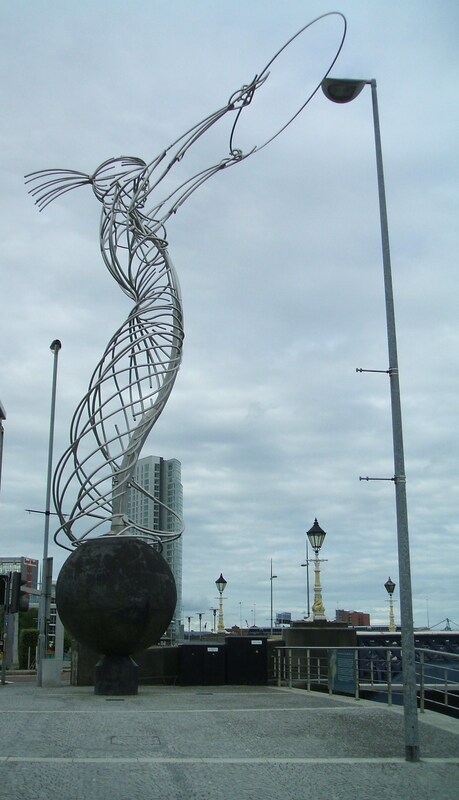 The female figure holds a ring of thanksgiving and the globe at her feet refers to universal peace and harmony, it has marked on its surface the cities where the people and industries of Belfast migrated and exported to. As with other public works of art in Ireland the sculpture has been given several nicknames. These include the Beacon of Hope, the Nuala with the Hula, the Bell on the Ball and the Thing with the Ring. 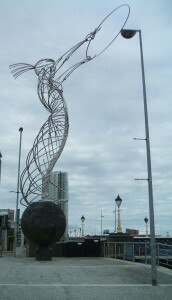 This entry was posted in Ireland, Photography, Sculpture on November 27, 2011 by Grannymar.